Akira Kurosawa (Japanese: 黒澤 明, Hepburn: Kurosawa Akira, 23 Mairch 1910 – 6 September 1998) wis a Japanese filmmaker. Regairdit as ane o the maist important an influential filmmakers in the history o cinema, Kurosawa directit 30 films[note 1] in a career spannin 57 years. ↑ In 1946, Kurosawa co-directit, wi Hideo Sekigawa an Kajiro Yamamoto, the featur Thae Who Mak Morn (Asu o tsukuru hitobito); apparently, he wis commandit tae mak this film bi Toho studios, tae which he wis unner contract at the time. (He claimit that the film wis shot in anerly a week.) It wis the anerly film he iver directit for which he did no receive sole credit an the anerly ane that haes niver been released on hame video in ony shape. The movie wis later repudiatit bi Kurosawa an is aften no coontit wi the 30 ither films he made, tho it is leetit in some filmographies o the director. See Galbraith, pp. 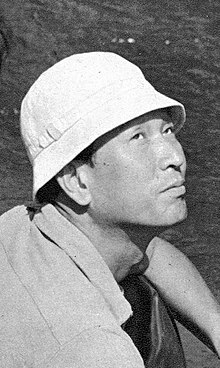 65–67, an Kurosawa's IMDb page. Wikimedia Commons haes media relatit tae Akira Kurosawa. This page wis last eeditit on 11 Februar 2015, at 17:03.